Almost everything you know about Mickey Mouse is wrong: he wasn’t Disney’s first star; Steamboat Willie wasn’t his first movie; Mickey wasn’t a nice guy—and Walt Disney didn’t invent him. In 1928, two very different best friends invented Mickey Mouse. And the success tore them apart. Walt Disney and Ub Iwerks’s friendship is a story of betrayal, love, war, money, power, tragedy, intrigue, humor, despair, and hope. You’ll love them both—when you don’t want to drop anvils on their heads. Discover the men behind the mouse, and the mystery behind the magic. A Mouse Divided is a stirring depiction of two underdogs. One invented Mickey Mouse—and one said he did. You’ll love Walt Disney more than you ever thought possible—until you don’t. 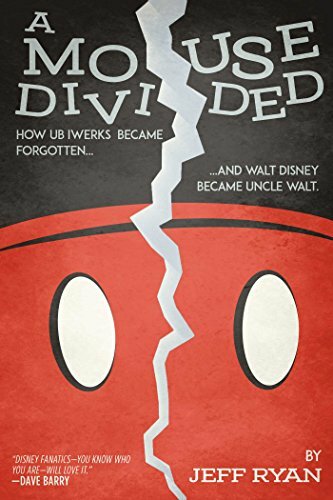 And you’ll sympathize with Walt’s friend-turned-rival Ub Iwerks, always in Walt’s shadow. This true story of how the Disney empire was made is a captivating page-turner, endlessly fascinating and revealing. And it’s never been fully told—until now.